For today's palette I'm taking inspiration from 'Kathedra', it's beautiful shades of grey and sandstone textures, hints of lichens and moss, crumbling weathered surfaces contrasting with the sculptors chisel marks. But then adding interest with tiny pops of jewel colours like mustard, red, purple, olive and royal blue, thanks to namolio. 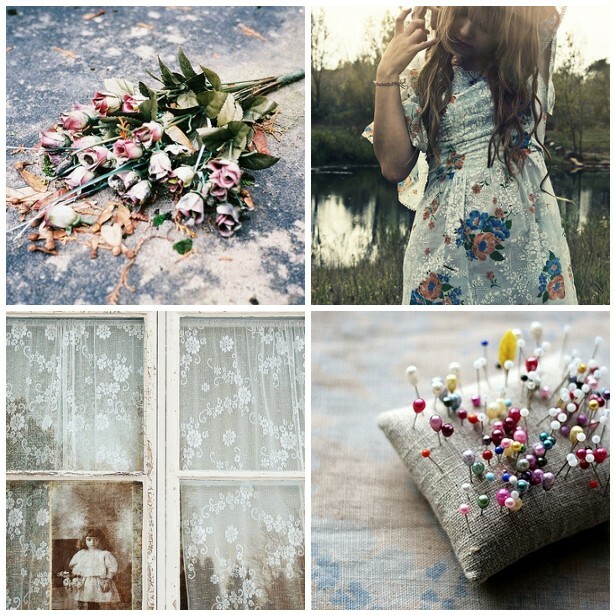 I'm also loving the white on white florals in the net curtains and that beautiful dress in the mosaic, very pretty! Today I'll be making a wee trip to the post office to send away a few more custom orders, then I really need to get on and do some finishing on a gift for a very dear friend who is coming to visit us very soon. Can't wait! have a beautiful weekend you too, Emma! Beautiful! I love that dress, too. Here's hoping the sun shines in Edinburgh this weekend! Oooh, I am particularly in love with these colours. OH! Gorgeous! I love these!! hooo it's beautiful. i love this colors and these pictures. very good taste. i love. the picture with the girl makes me think to "the brightblack morning light" music and spirit.